Understanding pain is extremely important in being able to successfully manage it and return to a happy, unrestricted and pain free life. 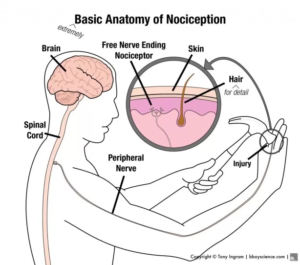 This blog explores the process of nociception and the pain response. Pain is an unpleasant sensory and emotional experience which motivates us to stop a certain action or behavior in order to avoid it. This is an important biological mechanism alerting us to potential or actual harm of body tissues such as muscle, bone, ligaments, tendons etc. Interestingly, pain is NOT always a marker of tissue damage (i.e. increased pain does not always mean increased tissue damage). This is a key concept in understanding chronic pain. So how do we know when pain is harmful? The body has a process called nociception which is used to detect and transmit negative sensory input information our nerve endings receive to the brain. The nociceptors job is to relay information to our brain where the stimuli is interpreted as potentially or actually damaging to the tissues of our body. For example: if an external stimulus is dangerously hot, specific nociceptors will be activated (thermal). They will send a message to the brain that processes this information and tells us the input is hot. If a stimulus is dangerously hot and compressive (mechanical) to a body tissue, the nociceptors will be activated at a higher rate. An example closer to your pain? The nociceptors also detect internal damage (not just sensations on the skin). When a body part is injured, an inflammatory response (chemical) usually occurs. The nerve endings detect this inflammation (internal swelling) and send such messages to the brain. Okay, but why has my pain become chronic? The inflammatory process we just mentioned, can cause chemical changes which lowers the threshold at which the nociceptors are activated. The body does this to help protect that area by telling us the injury is more painful than perhaps it actually is (increased pain response). If nociceptors are active for a long period of time (when pain has not been managed correctly or adequately), they also become increasingly sensitised to stimuli that may not usually cause pain, and an increased pain response is elicited. 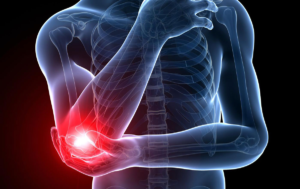 Physiotherapy primarily addresses the physical aspect of pain and other potential influences on unresolving pain. The aim of treatment is to return nociceptors back to a normal rate of activation where non-harmful input does not lead to a pain response. Appropriate treatment helps desensitise (return the threshold of activation back to normal) overactive nociceptors to decrease the feeling of pain. By lowering pain perception closer to normal, we facilitate active participation in rehabilitation to return you to a pain free state. We can identify movement impairments that can be altered to remove musculoskeletal contributors to pain and also use a number of tests to rule out pathologies that can lead to an increased perception of pain.